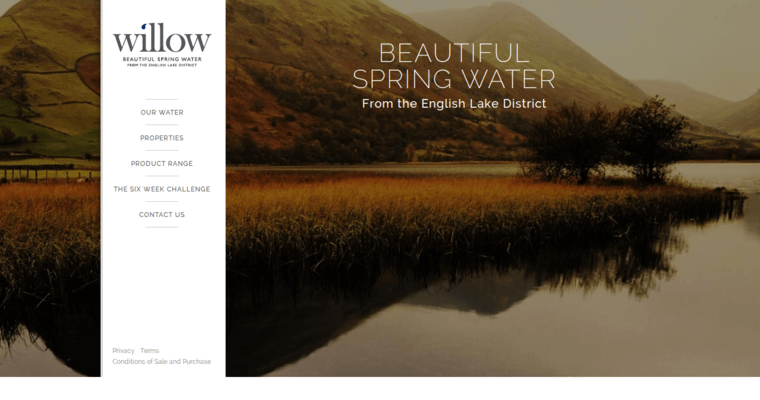 Willow Water is a beautiful spring water that comes from the English Lake District, which boasts the highest level of rainfall in the UK. This spring water's unique properties include salicin and calcium which are gathered during the rainfall's journey to the aquifer. First, the water travels through a thick layer of the peat, remnants from a prehistoric forest of white willow trees. As it travels through the peat, it gathers salicin, which is found in the bark of willow trees. In ancient times, the bark of a willow tree was said to lower pain and high body temperature. Calcium is added as the water is naturally filtered through a layer of limestone. The properties of this water improve the skin's condition, prevent bone and mobility complications, and provide essential minerals for overall health.